In the season finale of Brooklyn Nine-Nine, it’s a race to save Captain Holt from his evil doppelganger, Bob Anderson. We pick up right where the last episode left off: Amy’s gotten the names of the dirty agents from Figgis’ sister. Jake calls Holt in a panic but he doesn’t answer because Bob Anderson is holding a gun on him. 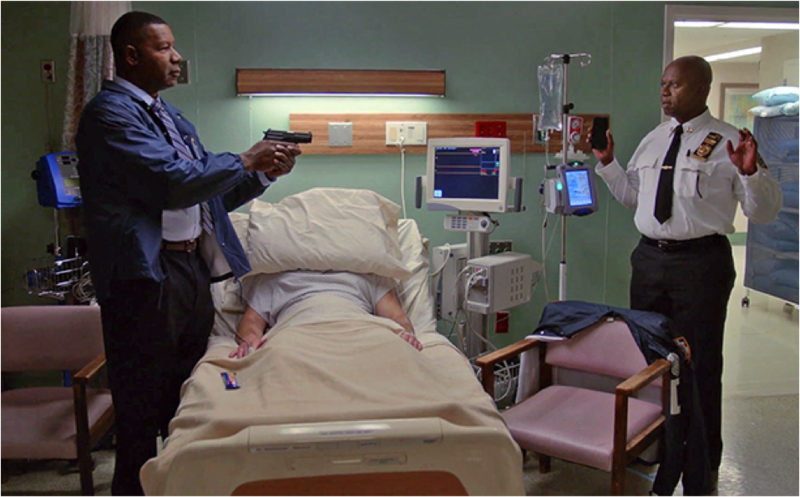 Gina uses her phone app to determine that Holt is still in the hospital so the team heads there, only to discover that Agent Wheelen is dead (Bob Anderson suffocated him) and Holt is missing. It seems Holt has left them some clues: he has smeared chocolate from a candy bar on the “H”s of several hospital signs. Jake misinterprets the “H” to mean “Holt,” and leads Rosa, Hitchcock, and Scully in circles trying to find Holt. Holt pocket-texts them and though it’s gibberish, Hitchcock and Scully are able to decipher it because, well, they’re savants when it comes to obscure things like deciphering text gibberish. They figure out Holt is trying to text that he’s on the roof and get up there just in time. Meanwhile, Terry and Gina have circled in from a different angle and while Jake leads an awkward stand-off with Bob Anderson, Terry just rushes in and tackles him. Problem solved. One problem, anyway. Holt is safe but they still need the file Bob hid from them that gives them all the evidence they need to implicate Figgis. Bob Anderson refuses to talk, though, convinced that Figgis’ men will come to rescue him. He’s proved right when the bad guys show up at the hospital before the team can leave. Jake and team try to sneak out pretending to be doctors. This works for about two seconds. If Terry hadn’t been yelling out inaccurate medical terminology he learned from Grey’s Anatomy, it probably would have gone better. Meanwhile, Amy and Charles are on their way back to New York to help the team. They extricate themselves from their undercover gig at the prison and head to the airport. Amy’s still wearing her fake pregnancy belly because there was “no time” for her to remove it before racing to the airport. It comes in handy though as she’s able to bump them to the front of the line and secure first class tickets. As it turns out, Charles turns into a complete diva when flying first class. While Amy and Charles enjoy ice cream sundaes and watch 27 Dresses at 30,000 feet, the rest of the team manages to exit the hospital with Figgis’ men in hot pursuit. They head to Rosa’s apartment, which she says will be the safest option because no one knows where she lives. When Terry reminds her that Amy visited her apartment once, Rosa says that was her old apartment — she moved the next day. Her new apartment is rented out through a shell corporation, her mail goes to a P.O. Box in Queens, and the lease is under the name Emily Goldfinch. Knowing they’re safe, the team proceeds to try out their various interrogation tactics on Bob. Nothing works, but the team has an elaborate ruse left to play. Amy and Charles have landed and they cut the power in Rosa’s apartment, making it seem like Figgis’ men have found the hideout. Then they make it look like a sniper is trying to take Bob out. Bob panics and tells them where they can find the file folder full of dirt on Figgis, Bob, and the whole operation. It looks like everyone is going to live happily ever after. Or are they? A week later the team is celebrating the arrests of 75 of Figgis’ men. They haven’t found Figgis yet, but they’re confident they will, and then Pimento will be able to come home. Amy tells Jake they should move in to together and he agrees. But there’s no time to celebrate because just then, Jake’s phone rings — and it’s Jimmy Figgis. He tells Jake he’s going to kill him and Holt for taking down his operation. We cut to a month later and we’re in Coral Palms, Florida. Jake and Holt are clearly in witness protection, going by the names Greg and Larry. True to fashion, Holt’s Florida lawn is lush, green, and perfectly manicured. Jake’s is unruly and brown, and has a plastic pink flamingo stuck in it. Overall, this has been a really outstanding season (excluding the awfulness that was Pimento). Amy and Jake are progressing in their super-awkward way, things with Charles are looking up (a baby on the way! ), and the rest of the team are their usual hilarious selves. Ending the season with the undercover-in-Florida cliffhanger could prove a fantastic start to next season. I don’t see Jake or Holt handling being neighbors very well, nor do they seem equipped for the Florida heat and humidity. I love Holt-Jake antics so much, and can’t wait to see what happens in this new locale.